For those of you who would like to join the Six Figure Club (SFC), it’s relatively straight forward. Charge $50 an hour for 40 hours a week for 52 weeks in a row and you’ll get the SFC invite in the mail! Of course, you’ve first got to develop some valuable skills, but that’s what college and all those extra hours side hustling were for. If you make $100 an hour working 40 hours a week, you will make $17,333 a month and $208,000 a year. That’s when you’ll really be able to live comfortably in any expensive city in the world. With my most recent Uber pay stub, I just might have found a way to get there after only three months of driving. The great thing is that if you have a car, a relatively clean record, a smartphone, and a willingness to hustle, you can probably earn six figures from Uber as well. I decided to drive for Uber because the company is one of the most popular private companies in the world, valued at $50 billion, and based right here in San Francisco. I wanted to see what it felt like driving a car for a living, and whether it could be a viable income stream to support oneself in an expensive city. If it was, then surely driving could be a great means for many people around the world to help make ends meet as well. After driving for two months, I knew I could easily make ~$50,000 a year driving 40 hours a week. What I didn’t expect, or believe, was that many drivers were actually making a solid $100,000+ a year. I had to learn more. My friend Jabir makes $100,000 a year by not only driving ~50 hours a week, but also by lending out his second car, a paid off 2012 Honda Civic, to his younger brother and friend for 40% of their profits. His goal is to regularly bill an extra 60 hours a week at ~$12/hour after his cut of $30 / hour. That extra 60 hours a week earns him an extra $38,000 a year in passive income. Then I got to talking to my Uber driver from JFK airport to Manhattan when I went for the US Open. He said he made $115,000 in 2014 driving for Uber. He revealed he was able to earn extra income because he was rated 4.8 out of 5.0. With a high rating, he gained access to the lucrative NYC – Hamptons route, which limits the number of Uber drivers on any given day. Every weekend for six months he was earning 50% more an hour thanks to an artificially low supply of drivers. Finally, I talked to another Uber driver on the way to Nyonya, my favorite Malaysian restaurant in Manhattan, and he mentioned he also makes over $100,000 a year as a driver. He said he earns roughly $70,000 a year from Uber, and another $40,000 as a private driver for one of Manhattan’s real estate developers. The developer hired him after being his Uber passenger. With three examples of regular people without a college education making over $100,000 a year driving for Uber, my motivation to drive was rekindled. I read everything I could about maximizing my income, and was able to achieve a $42/hour gross rate (see pic above) from $28/hour when I first started. An annualized income of $82,000 gross a year is pretty damn good, but that’s still short of entering the Six Figure Club. So, as any lazy person would do, I gave up after a week since $42 / hour is still not the best use of my time as a middle-aged man. Then, I got my latest weekly earnings update. See below. 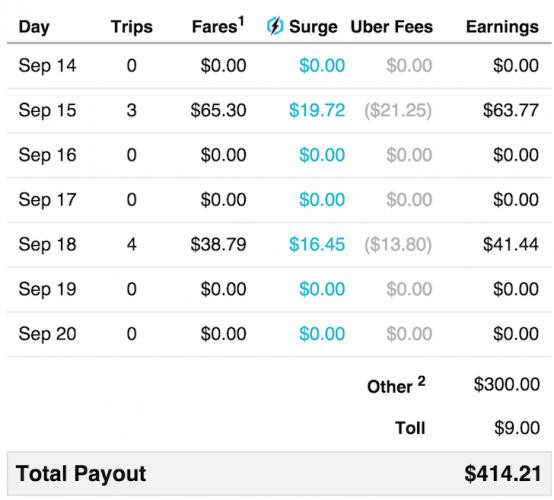 I made $414.21 NET of Uber fees after only driving for 3.6 hours! That comes out to a whopping $115 / hour, or a samurai slicing $240,000 a year if I am able to drive for 40 hours a week. Ah-ha! Maybe the three guys making $100,000+ a year driving for Uber were telling the truth. After all, driving was their full-time job, while driving for me is more about investigative journalism and story-telling. With this latest income report, I was reminded about the power of leverage. There are two ways any enterprising individual should think about ways to make money. The first way is to think about the total amount of money you can earn in a year, since the yearly salary is the standard way to calculate income. If you think this way, you’ve got the employee mentality. There’s a natural tendency for the majority to slack off or do the minimum over time since you’re going to get paid a set rate, no matter how little you work. Gotta love it! The second way to think about earning money is through the hourly rate. If you think this way, you’ve got the independent contractor mentality. I think in this way because I decided to hit the eject button from Corporate America back in 2012 due to boredom, a lack of correlation with compensation and effort, and my intense desire to be free. I only want to actively work about 25 hours a week so I can spend time on my online business and do other fun things. Therefore, my goal is to maximize my income on those 25 units a week. Take a look at the chart below that breaks down my $414.21 Uber paycheck for the week to understand how $115/hour came about. I only worked for two days out of the seven (Uber pays every Thursday like clockwork) for a total of $105.21. Meanwhile, I made $300 in “Other” and $9 in a toll, which is basically a reimbursement since I have to pay tolls up front. So what is this mysterious “Other” you’re wondering? Well, after I gave my first 20 rides when I first started out, I earned a $300 bonus under the Other category. Every new driver earns a bonus after giving a certain number of rides. This $300 Other income on this latest income statement is my bonus income for referring a San Francisco driver who successfully completed his 20 rides! The new driver apparently found me from one of my previous articles on Financial Samurai and decided to sign up and give Uber driving a whirl. Not only did I get the $300 referral income, so did he for a total payout of $600. The bonus amount depends on where you are located, but I think it is an absolute no-brainer to drive for Uber to collect the bonus payout (usually 10 – 50 rides). After that, quit and just pick up passengers along the way using their destination feature to make extra bucks. Why not? After the bonus is collected, I’d just use Uber to pick up passengers along the way to wherever you’re going using their destination feature. It’s not worth driving full-time anymore. The reason is because the hourly gross wage has drastically declined due to a large increase in drivers now in 2017. The great thing about this $300 income is that I had no idea it was coming. It was completely out of the blue, like seeing an Amazon gift box from a stranger at my front steps during a non-holiday period. Furthermore, it’s not like I’ve written a ton of articles about my Uber experience either. 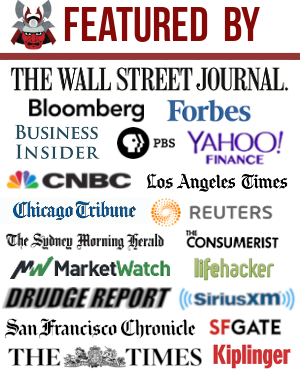 I only have two dedicated articles out of 1,100+ articles on Financial Samurai that revolves around my Uber experience. Out of the $414.21 income, roughly 25% was active, and 75% was passive. As someone who is trying to maximize his time based on an hourly wage, such a high ratio for passive income is solid! People make more money out there than you know. Getting a 9-to-5 job is not the only way to make six figures a year. Plenty of independent contractors also make six figures because they’ve learned how to maximize their time and leverage existing assets (a car, a second car, relationships, etc.). Don’t look down on people who don’t have full-time jobs. Try to figure out their secrets instead. Market yourself by registering your domain name online. You must have an online presence if you want to be found. Don’t let Facebook, LinkedIn, or Twitter be the owner of your brand. Own your own brand! By creating a presence online, you can market yourself much more efficiently. You can leverage your platform to make referral income like I do with Uber. You can also use your platform to earn consulting gigs, sell products like my book, and earn advertising revenue. My online income is well north of $200,000 a year, allowing me to no longer have to work a day job. Sign up for Bluehost to register your domain and pay less than $4/month for hosting your website. It’s cheap and easy to get started. Here’s my step-by-step tutorial for how to start your own website. Develop your X Factor. Think about your X Factor as your happiness insurance policy. Your X Factor could be methodically developing a network of key individuals over the years who could hook you up with a new job when the time comes. My X Factor happens to be starting Financial Samurai in 2009 as a place to share my thoughts about the financial crisis. I never imagined the site would give me the confidence to engineer my layoff three years later, make more than my day job in banking five years later, or give me opportunities to consult for various fintech startups in Silicon Valley. Continuously experiment with new ways to make money. Test, test, test! This is the main lesson I learned while consulting at various marketing departments. Someone out there is doing it better than you. Figure out what they are doing and replicate in your own unique way. Don’t just settle for one source of income. Nothing beats hard work. The up to $1,000 sign-up bonus to drive is nice, and everybody should take advantage. But one of the main reasons why I decided to drive for Uber is because I wanted to prove to all the incredibly annoying people who complain they aren’t getting ahead and aren’t willing to work more than 40 hours a week, that making a healthy income is possible if you try harder! Yes, you need a car that’s less than 10 years old, and a smartphone, but come on. Some of the poorest people I know whom I play tennis with during the middle of the day have the latest iPhone, 60″ LED TV, and pimp daddy car. Thanks to the sharing economy, there are so many new ways to make money nowadays. My goal is to consistently make over $100 / hour through Uber by mid-2017, which I have. I’m a big proponent of working smarter, rather than harder. But in order to get smart, you’ve first got to put in your time! The first step everybody needs to do is start their own platform online. Once you’ve got an online platform, your income upside is unlimited! I understand the deal here is to get that referral money. But, I drove for uber for two months in order to raise some cash flow. Not to make money, but to raise some cash flow. 1. I actually enjoyed it most of the time. 2. Depreciation, in the form of miles. Driving 40 hours a week can put 1000 miles in your car. Everyone can do the math. Four years of this will put 200,000 miles on your car. 3. Insurance. How many drivers have supplemental insurance. I didn’t. 4. Pukers. It happens more often than you would think. 5. Dead miles and dead time. 6. How many drivers enjoy having a drunk rate your job performance? Yeah, in NY. This is not the norm everywhere. Not in NC that’s for sure. The normal is earning minimum-wage and hating life. Financial Samurai is a place to be abnormal and a good sense. To figure out how to leverage the Internet and knowledge to make more money and lead a better life. Very cool & inspiring. I get what people are saying about not counting a one-time bonus as an hourly wage but I also think like a boss & not an employee so I get it, Sam. I just drove for both Uber & Lyft today for the first time! I got laid off a couple of weeks ago & am trying to figure out where I want to go with my life (@ 35 with technology & medical sales experience & so done with corporate America). I made the easiest $100 I’ve ever made today with both Lyft & Uber. I could see myself making good money with them actually & I’ve been in the SFC for years now. My best friend has urged me to start a blog for years now! I just may look into it, Sam! Thanks! Question. This article mentioned a guy who loaned his car for 40 percent of the income. Just wondering is there a way to set that up for guaranteed payment or because it was his brother and and a friend was it just a trust, honor payment? Crapy post. The hourly gross rate is 105.21/7.2=14.6 dollars. That is without deducting the gas cost, auto maintenance etc. In fact driving Uber is a losing concern if you add gas cost and auto care. All these people are hallucinated by becoming a easy taxi driver. Making nothing at all just wasting time. You missed the point of the article regarding leveraging the internet to earn referral income. I have driven for Uber now for 5 months, and have definitely NOT had the same experience. I gross about $18 an hour before expenses, and not including a ticket I recently received for rolling through a stop sign. I would say your experience is rare, and limited to the San Fransico / NYC area. I am hoping Uber drivers can at least be eligible for minimum wage, we desperately need it. You are right in that living/working in a denser city has more fares. But remember, living in an expensive city has more costs as well. A one bedroom in SF costs $3,000+/month! The key to making $100/hour is by starting a website and earning referral driving income. I’m an Uber driver, very street savvy and knows all the roads very well. I have a 4.94 rating due to going out of my way to ensure each rider is comfortable and has the best experience. I hate to be a “critic” of this but simply not possible. You would have to be in every prime time spot almost each and every ride . Furthermore you don’t know where you riders are going and were you will end up at? You can make this much late at night in specific situations but not often enough. Don’t count on this to be specific to your region and area. Just not a good representation of earnings. Airport runs are great too early morning as well. You missed the point about using the Internet to make money easier through driver referral income. The Internet is all about leverage so you don’t have to trade your time for money. I felt suffocated so decided to change the situation, drove part time last year while I learned to be a developer and now work as a full stack .net developer from home n love it, so 10-15 hours/week of Uber will be great to fill in any gaps in income until I am able to charge a better rate:)..
OMG your article is great! I have learned more about making money just reading this article then all my years of experience. If you look at earnings as hours ×’s rate = X. I was always thinking in ways getting a high paying job when in fact you can have any job ×’s hour’s =’s. Ha ha. Awesome! Look at it as hours per day × a week, it makes it easier because your focus is not on work but time. You changed my life, there is not enough thank you’s, so here is at least one, THANK YOU and God Bless you and yours! Plus, haven’t surge pricings gone the way of the dodo in the past week? I’m in Dallas/Fort Worth. It’s not looking to optimistic right now for Uber/Lyft with the rate cuts. Plus I’m new to this and am in a fair amount of debt. I just don’t see how a driver can make close to $70,000 a year without driving 24/7 and 22 hours a day if not more on uber fares alone. And how many referrals can one expect? That would be where the real money comes in. Thank you. Driving for the sign up bonus and making referrals really is where the money is. Even if you can get just 4 referrals a month, you can make an extra $400 – $4,000 a month, depending on the promotion. This is why having an online platform is a good idea. you might make that much in high dollar areas like NYC. but other places don’t pay out no where near that. I did uber for several months in Atlanta on friday and saturday nights. It paid okay for the first 6 weeks. about 25-28/hr but then dropped off when too many drivers were hired and rates were cut 20% to increase consumer use. I have a friend doing uber that lives in a busier area. He works as a waiter in the evening so he has more flexibility with his schedule and can wait at home until he picks up another fare. You also don’t take into account: fuel, brakes, tires, oil changes, vehicle interior cleaning etc. Those costs could easily crush your pay 30% or more. You also shouldn’t include the $300 “other” as part of normal pay unless you’re averaging that nearly every week. It’s definitely a good idea to think outside the box and experiment with different ways to make money more efficiently. There’s lots of money to be made everywhere. You just have to find what works for you. Pretty close to mid-2016, how’s it coming? I have a pretty decent commute right now (30-45 minutes each way) but somewhat flexible working hours. I’m wondering if getting some rides correlating to my commute times is possible; I go through downtown (or add 5 minutes and go past the airport) both ways, so I feel like picking up a ride on my way to work and on the way home is possible. An extra $15-20 a day isn’t a bad start, and that’s not including what I’d try to do on some weekends. Thanks for the helpful writing! It’s going well. I basically only Uber drive when I’m heading somewhere farther than 20 minutes away nowadays. I’ll input my destination in the app, and it will find riders on the way to pick up. It’s a great way to earn extra gas money and side money going where you are supposed to go anyway. My Uber affiliate income hasn’t picked up as much as I thought. Perhaps it’s because Uber has been cutting rates. But they are back with $40-45/hour guarantees at least here in SF after they cut too far in Jan-Feb. I still think everybody should sign up for Uber and drive to get the initial bonus figure. You’ll then get an affiliate link to earn money signing other people up. The best way to leverage your signup link is through a blog like this. You can start one for cheap today with Bluehost. Having an online platform is how you can really scale your income and earn more passively. I recommend quit driving regularly after the bonus, and just use the destination feature to make extra money. Pay attention when the sign up bonuses rise and when the fare guarantees increase as well. They make it worth it again for a temporary period of time! Great article Sam! I am an IT Consultant with 3 kids living in Dallas, TX and I work from home. Needing to start side hustles and seriously thinking of doing Uber as well. I am also looking to start a platform online and sell a product. Currently working to identify what niche product to sell. In researching Uber I came across the below article and want to see what everyone thinks… very interesting insight on Part Time vs Full Time driver formula. Rahman (part-time) Busiest Week: 18.57 hours / $37.07 per hour. Put simply: Rahman, like many other part-time drivers I spoke to, works fewer but very specific high-income hours and thus makes much more per hour than a typical full-time driver. 3 kids? why? why the number 3? what made you stop at 3 ? why have kids ? purpose? Just came across this article. I just find it funny that a Goldman Sachs alum is driving an Uber for giggles! On the tax front you are stuck with the self employment tax – around 16% I believe on top of the income tax. So the key is definitely having a car that you can maximize the deductions. That is to say that the wear and tear is offset by the depreciation or the mileage you file. If you are driving 200 miles a week at .50 cent a mile and took the mileage deduction that really adds up over the course of a year and will definitely offset some of the SE tax. Of course you can also deduct your cell, all car maintenance, car/lease payment if you have them, insurance, some meals etc etc. Just trying to survive just one day at a time Brian! Thanks for another great link Sam, however, I still wanted your take on which one you would go with as someone who is on a 100% 1099 income range of 180-200k taking.into consideration possibility of early withdrawal. As for your inquiry, my friend owns 2 mid sized super markets in Brooklyn. Great post. I have a friend who owns two businesses and just started driving Uber at night in NYC. I now see why. Also you mentined you have a solo 401k and sep ira. Could you explain benefits of one over the other? I am currently trying to decide between the two as a 1099. Your friend is hustling! It feels GREAT to see a direct correlation with effort. What businesses does he run? I guess 5 yrs at the earliest, for Google and Apple’s fleet of fully automatic self driving cars to arrive in 2020. What is Uber doing about this? Replacing it’s own Uber drivers with its own driverless self driving cars! I suggest you take that fact into consideration before believing this good $100/hr pay is here to last over the long haul. I agree with you that Skynet will probably rise in 5 years and we will be ruled by the robots. But we must STAND STRONG and keep hustling to stay ahead of disruption. Either ride the disruption wave, or get disrupted OUT. Hopefully mid-2016 is before 5 years to regularly earn $100+/hour. All I ask is for another year or two of such wages before it gets competed away to $0. One thing I feel comfortable w/ is that given I make money online charging zero, I’ve figured out the toughest way to survive. Hopefully, we all can keep learning. It’s part of the reason why I’ve tried to build so many income streams, just in case one gets crushed. What are some of your side hustles and various hacks to make money? I’d love to learn from you. Most of us in corporate America actively “work” less than 25 hours a week but get paid for 40! LOL, you are probably right! Which is why traffic is highest on my site during work hours. Put I know when I worked, it was more than 40 hours a week of real work. I think this is the first time in 14 years that I wished I drove. I’m doing something very similar to you, at least in regards to working extra hours on a side hustle. I’m in the process of getting a second job. It’s a work-at-home job (before anyone asks, no it’s not a scam and yes I did the research). It only pays 15 bucks an hour with no benefits, but I can work up to 29 hours/week. Pair that with my 40+ hours/week at my day job and the other passive income work I do, and I’m hoping to really supercharge my income. I just have to either clear it with my current employer (all outside business activity must be approved, even if I were to become a supermarket cashier during my days off) or hope they don’t find out. They already denied approval to a teller who wanted to work for a construction company as a laborer. Does anybody know if my job is able to find that out if I don’t tell them? You’re right, Sam, in that if we truly want to get ahead, we have to work way more than 40 hours a week. Even though I think that 30 is more than what we should be working, sometimes reality doesn’t mesh with what we want. It was your Uber and minimum wage job articles that opened my eyes to the idea. So thanks! I’m a little disappointed the income wasn’t purely from driving from Uber, but good haul nonetheless. More power to you. Long story short: Guy signs up for Uber and uses the captive audience in his car to hawk jewelry he makes. All in, he made ~$36k gross from Uber, while selling ~$216K (revenue, but assume big margins) in custom jewelry to his Uber riders. That’s in one year. I imagine there are a million ways to add a little incremental revenue to make driving that much more profitable. Something as simple as selling candy bars, or even a cheap pair of sunglasses on sunny days, would probably add quite a bit at the margin. Uber is really something special. I was skeptical of it, and its valuation, for a really long time. But I don’t know if there are many business models that even come close to how great Uber’s is. Someone out there is always hustling. Just going through the matrix and working a day job doesn’t engender the hustle mentality. It engenders the false safety mentality… like wild animals in captivity, relying on a caretaker to feed them. People make much more money then people think! That’s pretty awesome. I’ve been tempted to try Uber to make some big bucks during the surge hours when I’m free. Not sure I could keep up $50-100/hr consistently but might be an interesting way to make some serious beer money and meet random strangers. My concern is that our insurance and our umbrella liability policy explicitly said “no for hire driving” like Uber. That and my car is an older piece of crap. Guess if I could swing the insurance coverage somehow I could pay for a new car from very occasional driving. In other news, I just finished my first paying consultation in my new Lifestyle Consulting side hustle. I’m launching a page soon on it. $75/hr consulting fee for early retirement lifestyle/money consulting and planning. Lots of people asked me to chat with them and they would pay me, so I figured it’s worth a shot to make relatively easy money while helping others. Craziness. Nice job! It’s all about building a platform. Once you build a platform, you can leverage your platform for so many things. I would love to see your net hourly rate, not gross. It’s in the chart above. $414 is the net amount after Uber’s commission. And the great thing is, Uber doesn’t take a commission on referral income. Very interesting article. Gotta try it out! Sam, can you guve me a referral. Sid, you can just sign up to be an Uber partner here. After you sign up, it should tell you what your driving bonus is after 10 or 20 rides. Very interesting. It makes me want to try it. But are you forgetting the bite that the taxman taketh away? Isn’t take-home more like 63% or 75% of your total? I understand the desire not to work due to taxes. Heck, I wrote a post about Going John Galt myself. However, it’s hard to escape taxes. Better to make 70-75 cents than 0. But maybe not. Also, not sure where you’re commenting from, but in the States, everything is quoted on a gross annual income basis. 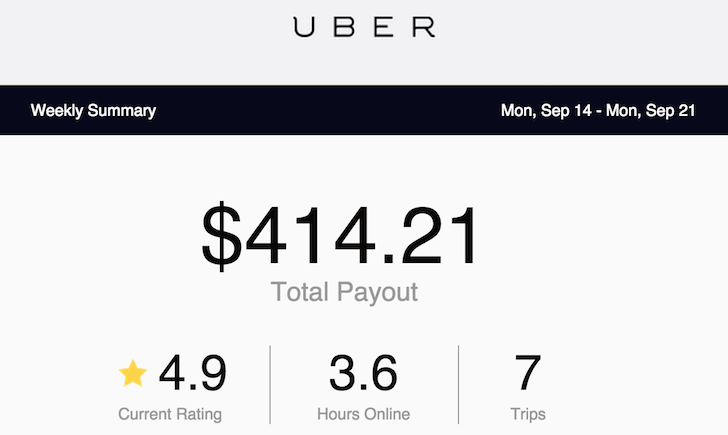 This is amazing – I never would have thought you could make that much money driving for uber! Coincidentally, I just wrote a post on my blog the other day about how I don’t have a side hustle, and don’t plan on getting one. I like to focus my time and energy on excelling at my day job, and I feel like a side hustle would just be distracting. I do understand that argument that with multiple income streams you are protected should one fall through, but I feel like that can also be achieved by having savings and being a strong, versatile performer who can get hired in any job market. Maybe I’m too optimistic since I’m young, so we’ll see if the next recession changes my mind on that! Once you start a side hustle, you’ll wonder why you didn’t start one earlier. You’ll wonder what you were doing with all that free time! I used to watch some sports on TV or DVDs. Now, I just use that 1-3 hour spot to side hustle. Lots of fun, is profitable, and I get to write about it now. An NFL football game takes 3-3.5 hours to watch. You can do A LOT in that time period! U just DVR the game, and watch it in 30 minutes now by fast-forwarding everything. What cell phone mount do you use when you are driving for UBER? Sam. Have you considered the personal safety factor for women drivers? Not as much, partly because 1) Women are just as capable as men, if not more so, 2) There are strategies involved in NOT accepting a rider rated under a certain level. My cut off is below 4.6 and I will not pick up, 3) The social currency and tracking system is very strong now. If you want to assault an Uber driver, you are screwing yourself b/c all your info is there as a passenger in order to ping an Uber. You will be tracked down and locked up in no time, compared to just hailing a cab and assaulting/robbing the driver. There’s risks to everything one does. Looking both ways, learning how to better protect yourself, and hustle are a part of society. Couldn’t agree more with the hourly vs salary mentality. I am fortunate (or unfortunate) to be doing both. Currently working corporate pharma for 40 hrs/wk while maintaining my side hustle as a locum pharmacist (hourly rate much higher than corporate). Get lots of vacation/stat holidays (5+ weeks) so sometimes I work on those days and get double income. I look at my corporate colleagues and most often they have no concept of how the other half works and sleeps. They have no idea how easy/lucky they have it as a salaried person. Sam, I’d be interested in the tax implications of earning income from these ride sharing programs. How are you taxed? Can you bill through your business entity? Can you write-off Uber expenses/mileage/car depreciation/etc? Excellent job side hustling! You’ve got the best of both worlds, and something I’m considering doing again after I visited my friend down at Google. Uber Income is considered self employment income and you have to complete a Schedule C..
One thing Uber drivers need to be aware of is that the 1099-K (and 1099-MISC) you receive shows the total amount that Uber collected for your rides; it does not have their fees, commissions, safe rider fees or phone rental payments taken out. You need to deduct those as part of your business expenses along with the mileage you drove. In order to drive, of course you need a car. Hence, the cost of owning and maintaining a car are deductible expenses. In order to drive, you also need a smartphone and a wireless data plan. Those are also expenses that count towards your income. If you are to drive, you need energy and liquid, etc. Can you depreciate your car then? I wonder if the value of all the deductions for your car, smart phone and coffee, are worth as much as the net income you make, especially if you can pay yourself through an entity that you wholly own, then use something like a solo 401k to deposit 25% of your income into retirement savings. Seems like the tax benefits are the real silver lining here? You probably can. You can do all sorts of things as a business owner. I’ve got a Solo 401k and SEP IRA. Each can contribute up to $53,000 pre-tax. But in order to do so, I’ve got to first make ~$212,000 after expenses to contribute 25% pre-tax. I just had an interesting idea. Since I go out of town on business trips almost every week, rental car already paid for, it would cool if it was possible to us the rental to make side income. To remain ethical, I would just pay for the gas out of pocket for the Uber driving portion, and only expense the commute to the day job customer. It’s unlimited mileage, so it’s not going to affect my employer in cost. But, since I haven’t driven for Uber before I don’t know how it would work to have a different car every week. It sounds nice though! It’s a good idea. Check out FlightCar, where you can park your car and they rent out your car for you. There are so many ways to make extra income now, it’s in an upcoming post! Well technically I was talking about using my Enterprise rental cars to become an Uber driver all over the US, but after researching I see that isn’t allowed. I just looked up what they would pay for my year make and model at DFW, it would be $0.05 per mile under 75 miles, then $0.40 for each mile over 75. A 2015 would be $0.10, so I guess you just have to hope the renter drives a lot. I’ve got a post coming up about your question! Stay tuned. I would and so would a lot of other cost minded people. I was planning a flight to Detroit and wanted to get a rental car to go to a friends graduation and visit family. They wanted $200-$250 for four days. No other option than to pay it. It was more expensive than the round trip tickets. Something like this would be a great alternative for travelers that want to see a city but not want to break the bank or for when your car is in the shop. I originally looked at doing Uber when I travel as well, long story short, you can’t. You have to get a vehicle inspection for each car you register, and you are registered with a region. If I turn on the partner app when outside my home state, there is a message that I’m not authorized to drive in that region. Confirming this as well. I turned on my Uber partner app while in NYC, and it said I was prohibited to drive. Makes sense. The car must be registered in the state it’s mainly being driven in. Such a fun post, thanks! Congrats on those earnings, how sweet! The stories of the NYC drivers are fascinating too. I can see how there would be demand in Manhattan for private drivers – a great supplemental to Uber driving. Must take a lot of patience to deal with the city traffic though but it’s worth it for that kind of money. Getting access to the Hamptons is also huge. I remember reading about how they started restricting drivers there. That’s pretty darn clever of your friend to rent out his extra car and make a cut on two people using it to drive for Uber too. We subscribe to one of the more common principles of frugality in personal finance: Drive an old car. Therefore we aren’t eligible to drive for Uber. Actually I think one car is but we’ll lose eligibility at the end of the year. Yep, same for me. I take it one step further. I walk to work every day, so my mileage is minimal. A hybrid way to think is by asking what side hustles you can complete while at your salaried job. Most people have a ridiculous amount of wasted time at the office. If you learn to be efficient at work you can up your hourly rate by finishing side hustles on the clock or during breaks while being more productive for the man. Yes, yes, yes! That is one of the key takeaways of the post. Figuring out how to maximize your time. You can put a backpack in an empty train container, or you can load up tons of coal. Either way, you’ll get there at the same time. Might as well maximize. Gigs like Airbnb or driving for Lyft and Uber seem to be the ultimate side hustle. You can do it on your own time, working as many or as few hours as you’d like. I take Lyft rides in Nashville quite a bit and I’m always amazed to hear what other jobs my drivers work. Lots of musicians and creative types. But also people with full-time jobs trying to make some extra cash for a new baby or to save for a downpayment for a home. Yes, ridesharing is definitely a great way to help make extra income during the “dead hours,” which so happen to often be the highest paying hours (early morning airport routes, after 8pm – 1am when people go out etc). If you’re willing to hustle when other people don’t want to, that’s where you can really get ahead. Very nice hourly, but unless I am confused, my question is: Is that rate sustainable? It seems dependent upon you getting people to sign up through your site and then sticking with it. Is that sustainable? Even with your number of monthly page views, which is very impressive…? By the way, I have a full time job making >$250K/year, and Uber seems fun to me! Is it sustainable? Nothing good is going to be handed to me. I’ve got to earn it! Set goals, and deliver. If Uber doesn’t go out of business, if they continue with their referral program, and if I continue to share my experiences, then I strongly believe making $100 / hour is sustainable. I like the way your friend who lends his spare car out thinks. Lowering barriers to entry for potential Uber drivers in exchange for a percentage of future earnings is brilliant. To scale, what if you partnered with a car dealership and figured out a way to lower the initial purchase price of a vehicle in exchange for future Uber earnings on that same vehicle? Or better yet, what if you partnered with a rental car business and paired uber drivers with unused rentals? Possibilities are really endless… Great post! Aaron, the possibilities are definitely endless. I know one small business that has bought up 100 cars, and are doing the same thing with what my friend is doing by lending out his 2012 Honda Civic. Some of the most entrepreneurial, scrappy people are those who didn’t go to College, and who have had to depend on their own hustle and creativity to make money! My biggest takeaway from this post is to always position myself in an hourly wage mindset, rather than a salary wage mindset. This way I’m more motivated to be innovative in my time and find better ways to make money. Great post! YES! It’s all about OPTIMIZING your time for financial freedom! Figure out what your ideal amount of hours you’d like to work a week is (mine is 25 hours until I start getting bored/tired/disinterested), then find out various ways you can slice and dice those hours for maximum income. My ideal income for max happiness is around $200,000 a year. Hence, if I can find three activities that pay an hourly rate of $100/hour for 25 hours total, that keeps me motivated and happy. Active income is much more enjoyable than passive income, up to a point! I love talking to cab drivers (uber, lyft, whatever) because they’re some of the most enterprising folks in the world and they have the most interesting stories. I think the biggest takeaway from this is one you didn’t mention – your personal thirst for knowledge and how that results in learning about a new business model. I find that most successful people have this insatiable appetite for learning new things, even if they aren’t going to use it immediately (you aren’t going to become an uber driver full time). So many processes and techniques in one industry can be applied to another, learning about how someone does something as an Uber driver can teach you a new way of approaching a problem in your current domain. Thirst for knowledge is a good one. Don’t just take something you heard or something you do as given. Learn the WHY and HOW. Settling into a belief that there’s only one way is therefore limiting. So many of the “tennis bums” you see at the park during the middle of the day have actually figured out smart ways to OPTIMIZE their lifestyles after I got to talking to so many of them. They’ve developed income streams that allow the to play in non-rush hour times, which is the best time. Lots can be learned from the people you might think don’t have their stuff together. I feel like saying that including the $300 in your hourly pay and claiming that your made $100/hour driving Uber is somewhat misleading. The main reason I think this is the case is that the $300 referral income does not scale with your driving. If you have driven 40 hours that week, you still would have made $300 in the other category. Conversely, if you have driven for 15 minutes that week, you could have claimed to have made $1200/hour. 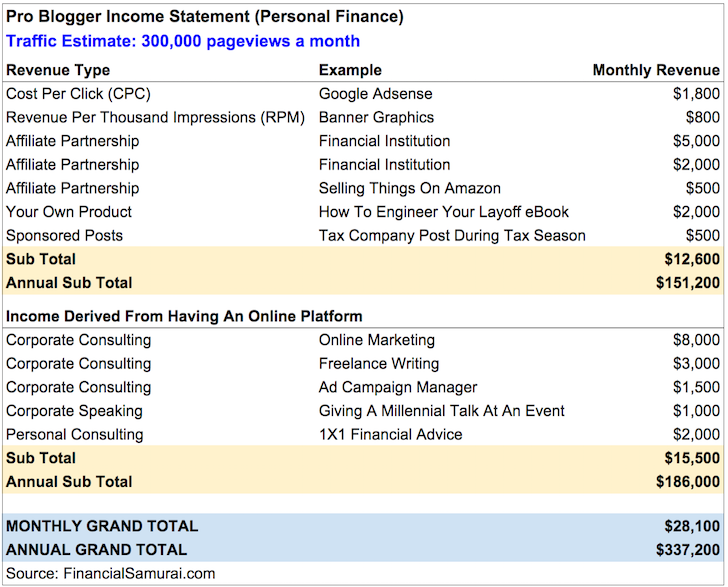 It seems to me like the referral income would be more accurately categorized in the same way that you categorize your blog affiliate income (since your blog is what is driving your referrals). Do you mind if I use your comment to juxtapose with a different comment for a new post to show the difference between two different types of money making mentalities? I think a dedicated post can be written about the Enterprising Mind. It’s so hard to break out of the status quo mindset of thinking like an employee vs. an entrepreneur/contractor/hourly wage earner that people aren’t willing to try and create a platform, their X Factor, and great goals. It’ll be a great post! Absolutely, I look forward to reading your post. Umm… bottom line is that $300 is a ONE-TIME-BONUS! You CANNOT count on other unknown bonuses and expect to get that amount for every hour you work! If the promo was $300 for every 20 rides your complete, then yes you could says you made that much in an hour! Otherwise, it’s a one-time bonus and you cannot expect to get any particular bonus in the future until you’ve earned it! Even then, you can’t adjust your hourly rate according to your bonuses that has been given to you! What’s that old saying… Don’t count your eggs before they’re hatched!!! No its dont count your chickens before they are hatched.. Lol. You must be very young. Referral income is great. And I’m all for maximizing leverage to maximize income. However, to me this demonstrated the power of leveraging your existing distribution channels and reach to break into new markets. With 1M monthly readers on Financial Samurai, I’m surprised you haven’t had more Uber referrals given the nice incentive. For $300 I’d be tempted to do it myself. Jack, a lot of folks have signed up. But very few have actually gone through with giving 10-20 rides. Like most things, only a small minority of people actual take action. The 1M pageviews is spread across 1,100+ articles. I will be writing more about the ridesharing economy over the next 12 months as it’s a part of my life now. This is a bogus article. Probably, some one employed by uber company , not the real uber driver wrote it. I know this is an Era for fake news. Uber driver might have car and place to live when he or she starts and lose both after two years. You lose your car, means you lose your job, that will of course make you homeless. Did you read the article and understand the message? I understand that everybody has short attention spans nowadays, but you’ve got to try harder to read thoroughly before making conclusions. LEVERAGE is what will make you earn more, not driving hourly. The way to make over $100/hour is by making money through driving referrals. One of the best ways to do that is by starting your own website to build your own brand online. I am with this being bogus info as well. … Driving is one gig, solicitation is a complete different gig. … If you are lucky to drive back to back you might be able to make 0.84 per mile @ $42 dollars an hour for active professional and courteous driving. Minus gas, vehicle maintenance and not to forget taxes …. $30 … $20 …$25 an hour … At back to back driving. … I am of course referring to the driving gig and not the hypy solicitation gigs. Yea my thoughts exactly. $400 a week is nothing. I make almost $200 a day and because of that I didn’t get the bonus and the chances nowadays of a driver referral actually working is super slim. Plus, you failed to mention all the risks and maintenance and gas etc. that go along with it. Also, beware Lyft especially doesn’t care about their drivers well being. Hahahahaha. To whoever said this article is fake. You’re probably right.